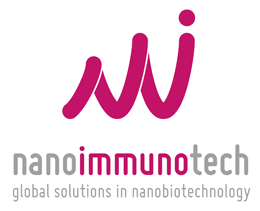 Nanoimmunotech started as spin-off from the cooperation between the Immunology Group from the Biomedical Research Center (CINBIO) of Vigo and the Nanoscience Institute of Aragón (INA), obtaining several awards like the reputed “Best Business Biotechnological Project 2008”. Nanoimmunotech produces and sells high quality nanoparticles being expert in oriented bioconjugation of these nanoparticles with any kind of biomolecule (antibodies, enzymes, DNA, RNA, small drugs, fluorophores…), meaning higher specificity and sensitivity in immunoassays. Nanoimmunotech is one of the few companies performing nanotoxicity studies, colaborating with several entities (pharma and food industries) and providing services a la carte. They have large experience especially in immunotoxicology.